Workers at the airport, which routinely hosts US military flights, need to fulfil stringent criteria. A SECURITY FIRM has been told to give its staff based at Shannon Airport a pay rise due to the “specialised” nature of their work. The recommendation was made by the Labour Court, which was adjudicating in a dispute between security workers represented by Siptu and their employer, Noonan Services. Noonan provides outsourcing services across the UK and Ireland in a variety of areas, including maintenance and cleaning. The firm also employs a number of people who work in security at Shannon Airport. 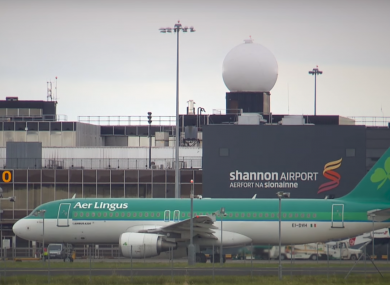 Siptu argued that the “unique circumstances and specialised nature” surrounding the security functions carried out by Noonan workers in Shannon Airport meant they should get an increase in their hourly rates of pay. The airport is routinely used for US military flights, with local group ShannonWatch claiming 730 such planes passed through the western hub last year. Noonan argued that the work carried out by the staff was not of “sufficient risk” to justify higher pay for airport security work compared to similar jobs in other facilities. Security clearance and garda vetting. The Labour Court found that there was merit to the claim for “the introduction of an allowance to reflect this unique and special situation”. It said that this claim exclusively relates to Noonan Services security workers at Shannon Airport. “The court notes, and accepts, that the union agrees that this recommendation is not intended to have knock-on implications within the security industry and will not have any application to any other circumstance within the security industry,” it added. The Labour Court said that Noonan and Siptu should meet to negotiate “an appropriate allowance that reflects the specialist duties”, although that deal should have ”due regard for the commercial circumstances and exigencies of the employer’s contract with its client”. The court also said that in return for the introduction of any allowance, the security workers must fully co-operate with all regulatory, training and assessment requirements as determined by Noonan. It said that the two parties should complete their negotiations within two months from the date of the mid-June judgement. A spokesman for Siptu said that the union wasn’t able to provide any more detail on the dispute, such as whether the security staff’s pay claim related to extra work performed as a result of Shannon’s use as a US military stopover. It also did not say if there had been any progress in the negotiations. Noonan Services hadn’t responded to a request for comment at the time of publication. Email “Shannon security staff are due pay rises for the airport's 'unique' situation”. Feedback on “Shannon security staff are due pay rises for the airport's 'unique' situation”.